Good morning! I'm back from another brief pause in posting due to vacation! 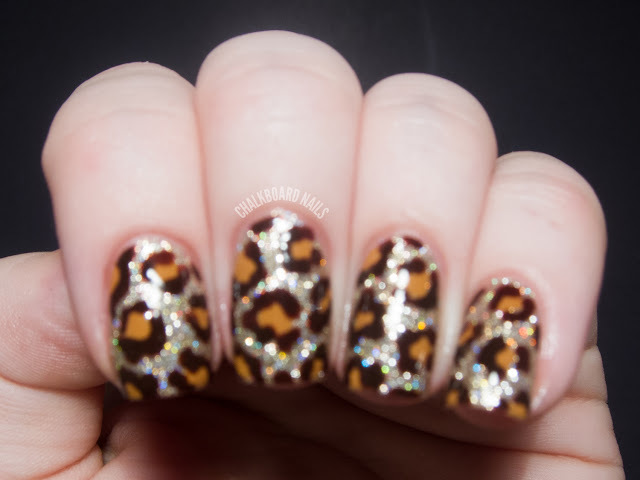 Today I'm sharing the first of my China Glaze On Safari nail art looks. If you'll recall, instead of doing swatches of new collections, I prefer to try to use all of them in various nail art techniques. I am not particularly fond of swatching and find that this method suits my area of expertise best. I also think that doing it this way provides people with some applications for these collections that they may not have considered! Hopefully soon I will have posts ready for you guys that use the rest of the colors. My first look is a leopard print! If you want to check out my tutorial for doing leopard print, here it is. I only use a dotting tool to achieve this look, so anyone can do it! I have been doing a lot of these lately, but what makes this one special is the glittery base. I used two coats of China Glaze I'm Not Lion, which, um, I love. First of all, I love the consistency. It's not thick or hard to apply at all. Second of all, I love the density. Full opacity in two coats? Yes please. Third of all, I love the color, a champagne-y pale gold. Finally, it's just so SPARKLY. It's a little gritty, but way less gritty than I was expecting it to be. I applied one coat of topcoat before continuing with the rest of my nail art. By the end of the manicure, I had applied two coats of topcoat, and that was enough to tame the glitter pretty well. Then I added the lighter pieces of the spots in China Glaze Desert Sun. I have seen this color described as butterscotch on a lot of blogs. It's very warm and reminds me of caramel. Something about the color is really comforting to me. Desert Sun is a creme and was easy to use in this nail art. Finally, I added the irregular markings on in China Glaze Call of the Wild. It's a dark brown red-leaning creme. This one gets a bit sheer around the edges, almost like a jelly. It's difficult to explain, because it is definitely a creme... You can kind of see at the edges of some of my spots where it gets thinner, clearer, and redder. And here's a bonus blurred picture so you can see the sparkle in I'm Not Lion. It's definitely got holo glitter in it, but still has a nice even texture when not in direct sunlight! 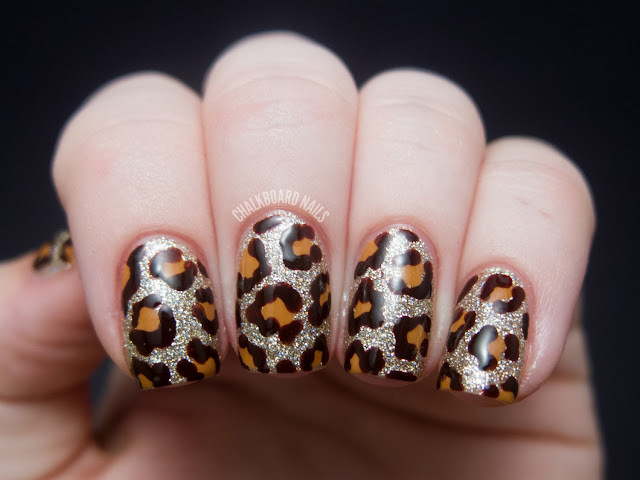 I hope you'll stay tuned for the rest of my On Safari nail art looks! Oh, these are so far up my alley it's not even funny. LOVE! I just ADORE this. Seriously. I tried my first leopard manicure just the other day as it was inspired by your tutorial and blog, but I didn't even think about using "I'm Not Lion" as the base. I thought I would use it as an accent or something instead, but I ended up not using it all in favor of the uniformity of all the nails for the leopard print. I'm kicking myself for not thinking of it. On mine I used Skull & Glossbones as a base color, with Barielle Wool You Marry Me and CG Kalahari Kiss for the prints. But I'm definitely going to try your sparkly version next. It's so great!! I already have I'm not lion, but now I think I need the other two so I can recreate this mani! so beautiful! love it<3 Leopard+glitter is perfect!!!!! Making me want them really bad now! Love how the base is glittery. Seeing 500 swatch sets of every new collection gets kinda old, it's nice to see some nail art in the rotation. I'm not much a fan of swatching myself, I'd rather do something fun and have a cute mani to show for it. this is amazing! they all go so well together! I absolutely LOVE this! I think I'm gonna do it today!! thanks! I absolutely am in love with this! I bought both of the glitters and love them both!! This is awesome. 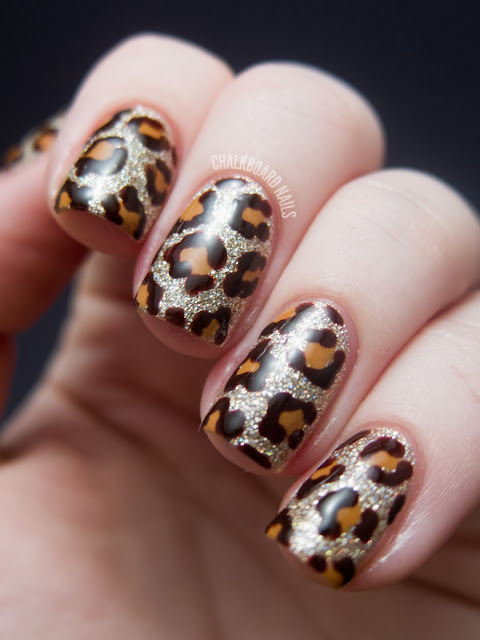 I'm not even that much of a fan of animal prints, but this is absolutely gorgeous! 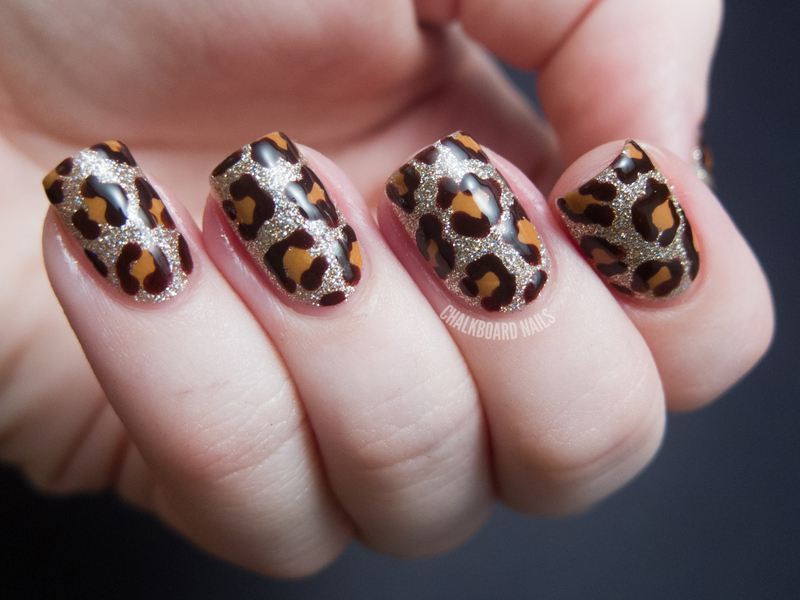 That's the most jaw-dropping leopard print mani I've ever seen. That's it, if that's how good they can look I'm going to start practicing! Absolutely fabulous! I love the way the glitter comes out on the blurred pic. this is so sparkly and pretty! i love it, amazing job. and i totally agree about swatching! i'm not a fan at all, id rather see some nail art! I love the sparkly base for this :) Looks so good! 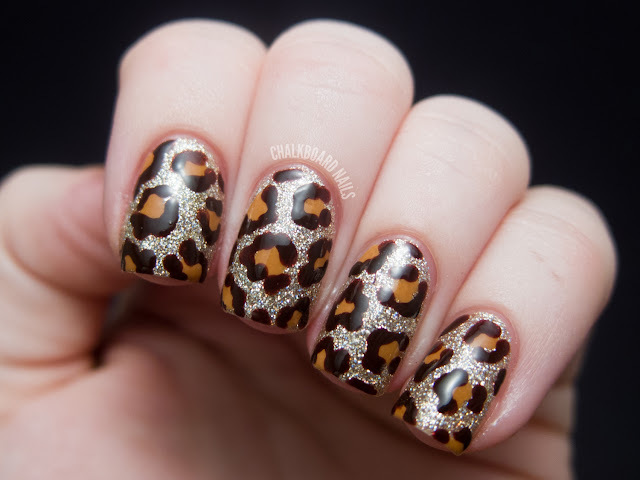 Very clever... Leopard print with I'm Not Lion! :) I also love that you are so creative with your swatches. This is brilliant and beautiful! I love the way you 'swatch' collections, it's unique. And of course your lion joke was hilarious, durr! I absolutely love these!!! gorgeous! I laughed at the "I'm not lion" joke :D! Love this manicure ♥. Gorgeous! And I like that you don't do the usual swatches. 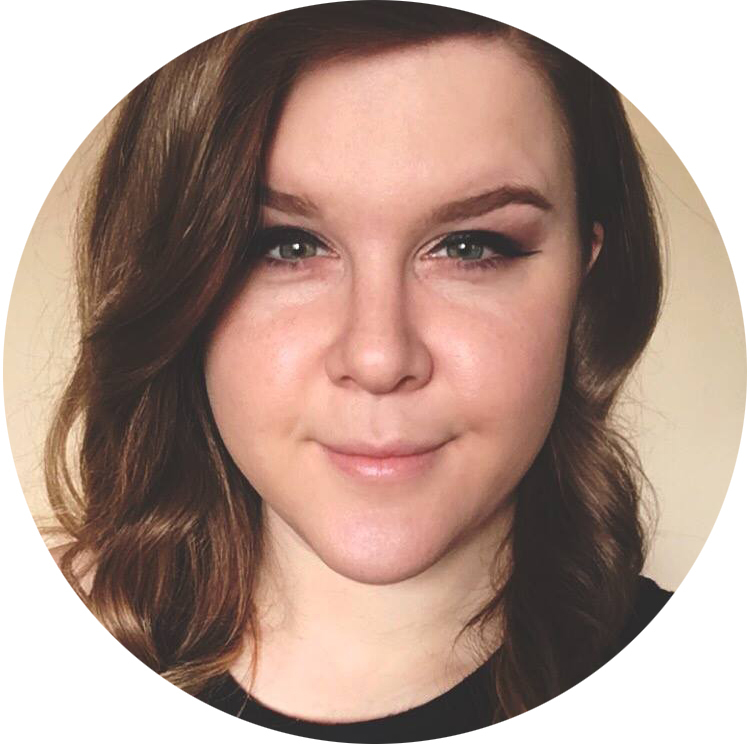 Once you've seen them on five other blogs, it's great to see them differently! I wasn't planning on buying any of these until I saw this -- now I want to buy them just to do this mani! Love it! I LOVE your nails! OMG! I want to try this. Love it!!! Definitely need to get those colors and try this out! I have been wanting to do a leopard mani so badly--so I just watched the video--you are BRILLIANT! I may try other "animal looks" with my dotting tools (just freehanded zebra and kinda just ok). This is brilliant and beautiful! it's unique.But i love Desert Safari Dubai. Is it available in Abu Dhabi, UAE ??? ?